Who says there’s enough love to go around? It’s that time of year again — parents’ evening at school. Last year’s conference ended with the history teacher crying and this year mildly pornographic novels are being passed around the fifth grade. One couple finds this seemingly mundane event suddenly revealing their deepest insecurities as lovers and parents. Julianne Nicholson was most recently seen in THIS at Playwrights’ Horizon and is perhaps best known for her starring role on “Law & Order: Criminal Intent” opposite Jeff Goldblum. She made her New York stage debut in Craig Lucas’ Stranger at The Vineyard in 2000 and also appeared in Jez Butterworth’s Parlour Song at The Atlantic. In film, Nicholson recently starred in “Staten Island” opposite Ethan Hawke and John Krasinski’s “Brief Interviews with Hideous Men,” and can be seen in the upcoming “In Praise of Shadows” opposite James Franco. Other film credits include “Flannel Pajamas”, “Tully”, “Seeing Other People”, “Kinsey”, “Little Black Book”, “One True Thing”, “Long Time Since” and “The Love Letter”. James Waterston has recently been seen in The Importance of Being Earnest at BAM, Orlando in As You Like It at the New York Shakespeare Festival, A.R. Gurney’s Buffalo Gal at Primary Stages, and Brooke Berman’s A Perfect Couple. At The Flea, Waterston was seen in Roger Rosenblatt’s Ashley Montana Goes Ashore in the Caicos. Some of his film and TV credits include “The Good Wife” (CBS), “Six Feet Under” (HBO, recurring), “ER” and “Dead Poets Society”. He will also play Brutus in the upcoming French tour of Julius Caesar. The design team includes Jerad Schomer (sets), Brian Aldous (lights) and Claudia Brown (costumes). 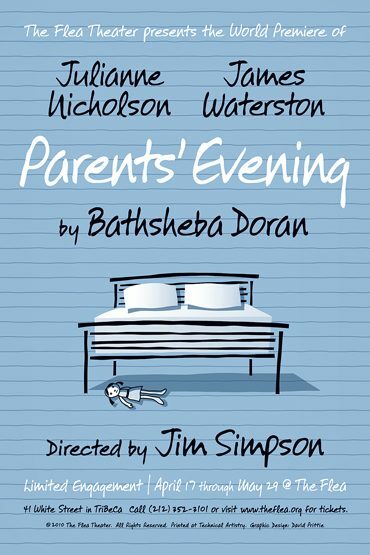 Bathsheba Doran’s play Parents Evening will receive its world premiere at The Flea Theater in April 2010, directed by Jim Simpson. Her play Ben and The Magic Paintbrush will receive its world premiere at South Coast Repertory Theater in June 2010. Other plays include Living Room in Africa (produced Off-Broadway by the award-winning Edge Theater), Nest (commissioned and produced by Signature Theater in DC), Until Morning (BBC Radio 4) and adaptations of Dickens’ Great Expectations (starring Kathleen Chalfant at The Lucille Lortel), Maeterlinck’s The Blind (Classic Stage Company), and Peer Gynt (directed by Andre Serban at the Theater of the Riverside Church). She is a 2009 recipient of the Helen Merrill Playwriting Award and three Lecomte du Nouy Lincoln Center playwriting awards. She is a Cherry Lane Mentor Project Fellow as and a Susan Blackburn Award finalist. Ms. Doran’s work has been developed by Manhattan Theatre Club, O’Neill Theatre Center, Lincoln Center, Sundance Theater Lab, Almeida Theatre (London), and Playwrights Horizons among others. Ms. Doran’s first play Feminine Wash was produced at the Edinburgh Fringe festival while she was a student at Cambridge University, from which she holds a BA and an MA. She then went on to Oxford University, where she received an MA before working as a television comedy writer with the BBC. Ms. Doran moved to the United States on a Fulbright Scholarship in 2000, and received her M.F.A from Columbia University and went on to become a playwriting fellow of The Juilliard School. She is currently under commission from Atlantic Theater and Playwrights Horizons in New York City and Schtanhaus in London. Her work is available from Samuel French and Playscripts Inc. She lives in New York City. PARENTS’ EVENING runs April 17 – May 29. Schedule varies. 80 minutes with one ten minute intermission. There will be a talk back with Jim Simpson on Thursday, April 22. Tickets are $35 for Monday – Thursday at 8pm and Saturday at 3pm, and $40 Friday and Saturday evenings, and may be purchased by clicking the red TIX link above. Tickets may also be reserved by phone at 212-352-3101.